In a football game, a receiver must be in sync with the passed ball to catch it. In baseball, the batter's bat must be in sync with the pitched ball. In your car, you want the brakes to be in sync with the brake petal. All of the musicians in a symphony orchestra must play in sync with each other. In these and so many more examples in life, synchronization is vital. Unfortunately, the vast majority of Americans suffer from out-of-sync insulin - also known as insulin resistance. This is so common that even medical professionals consider it "normal" - an unquestioned "given". 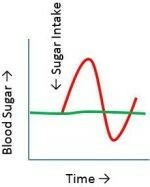 This graph is a typical representation of blood-sugar spikes caused by consuming sugar. The spike is considered to be a normal response; however, it is really due to out-of-sync insulin action, also known as Insulin Resistance. Imagine a football pass play. The receiver starts running as soon as the play begins and the ball is thrown. The receivers' run speed and direction perfectly aligns with the passed ball, both meeting at the precise moment for the catch. Now, imagine that same play again: the ball is thrown from the exact same position, speed and angle. The receiver also starts running from the exact same position, except this time, one end of a rope is tied around the receiver's waist and the other end is tied to a big bag of bricks. Do you suppose the receiver is going to sync with the ball for the catch? I think probably not. The receiver was resisted. Likewise, insulin misses the ball when resisted. Over the past three decades of managing and studying the control of Type-1 diabetes, I have learned that blood-sugar spikes do not have to be a given. 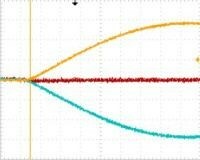 For illustration, I setup two function generators and a simple circuit to simulate the relationships between sugar intake, insulin action and the resulting blood-sugar and displayed the different relationships with an oscilloscope. 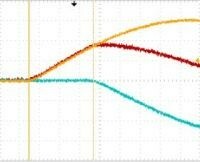 The yellow waveform represents sugar intake, the blue waveform is insulin action and the red waveform is the resulting blood-sugar. Normal blood-sugar is along the center horizontal grid-line. This illustration simulates typical insulin resistance. Notice the two yellow vertical cursor lines. The leftmost cursor line marks the start of sugar entering the blood stream. The second cursor line marks the start of insulin action. Notice how the blood-sugar rises in-step with the sugar intake until the insulin action starts. That is the blood-sugar spike. The time between sugar entering the blood stream and start of insulin action is the insulin resistance. 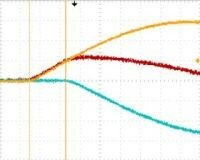 Remember; insulin enables energy, thus all of the time between the vertical cursor lines is lost energy. This illustration is the same as above, but with a little less insulin resistance. Notice how the red blood-sugar waveform spike is considerably less and the time between the cursor lines (start of sugar to start of insulin action) is less. That means less energy loss. You feel more energy and less fatigue. This illustration represents in-sync insulin action, with little or no detectable delay between sugar intake and insulin action. Notice there is no blood-sugar spike, even with the same level of sugar intake. Little or no insulin action lag time means no energy loss. At this level of insulin sync (sensitivity) every part of your body is running at peak efficiency. You feel extremely vital, alive, pain and fatigue free. How do you get your insulin in sync? Actually, insulin is naturally in sync, it is only out of sync when resisted. Resistance, by definition, is an impediment that makes any process slower. Notice how young children on a "sugar high" run about brimming with energy? That is because their insulin is still in sync and excess sugar (fuel) is efficiently burned into energy. So, the question should be; how do you stop insulin resistance and get your energy efficiency back? After three decades of experience, I have found it is really simple; cut all food ingredients that contain greater than 10% fat and eliminate all animal sourced products. If it's really that simple, why is it not common knowledge? Timing. 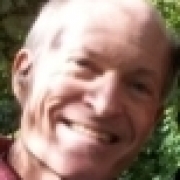 The timing of fats and animal products on insulin resistance is so slow that, even thought the effect is huge, the connection is misplaced. It is outside of our attention span. If ones' insulin resistance was zero - perfectly in sync and a greater than 10% dose of fat is consumed, no changes are detectable for 24-48 hours. With our typical attention span, it appears benign. When the insulin resistance begins to rise, however, the cause is obscure, but rise it does and remains elevated for another two to four weeks. Since the resulting blood-sugar spikes are easily within our attention span, sugar gets the blame. Because the effect is so long, it is additive. More fat consumed within that time period overlaps and adds to the already two to four weeks. As this cycle continues, the overlapping builds and builds extending the resistance - forever, making us believe it is normal. Once I discovered what was going on and became fat-free obsessive, it took more than a year before my insulin was finally in sync. By then, I felt so good I never wanted another bite of fat or anything from an animal. The lack of pain, sickness and fatigue is extremely liberating. Can you get too little fat? Yes, but that is called starvation. No, if you are eating sustainable calories. Fatty acids and amino acids are essential, but the required amount is very small. Fatty acids and amino acids are building blocks. Carbohydrates are fuel. Just like your car consumes far more fuel than car parts. It needs car parts only when something gets broken, but it needs fuel all the time it is running. The volume of repair parts needed for our biology is likewise very small. Over the years of personal experience, my vitality is always best with fat calories in the 5-6% range. Intramyocellular lipid concentrations are correlated with insulin sensitivity in humans: a 1H NMR spectroscopy study. Thank You Ken! I was eagerly waiting for that follow up. Once this is understood, it makes total sense! This piece reminds me of an article I read by Nathan Pritikin stating that because nearly all people are eating high fat diets, they will test positive for diabetes if they are tested at 7 PM because fat levels tend to rise higher at that time of day. I appreciate your comment. I would have posted it earlier, but work and life sometimes gets in the way. Perhaps the sugar swings that are viewed as normal are responsible for the "Glycemic Index" and the demonizing of carbohydrates.